I don't have much to say about Run, Man, Run. It's quality Himes. 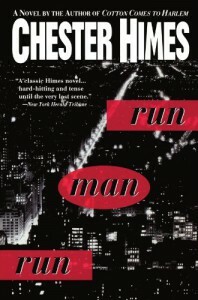 The most fascinating part of the novel is Himes' chilling depiction of the sociopathic detective Matt Walker, whose drunken rage and murders of two black men drive the story. Whether he's seducing and abusing women, murdering witnesses, or justifying himself, Walker is eerily compelling - Himes nails the sociopath's charisma and personality.